News from China and Russia: The roadbooks for the Silk Way Rally 2018 (July 15-27)are done! After more than a month driving accross China and Russia, the recos-team has finished to write the road book for this year´s edition. As announced, this route will offer a summary of pure pleasure to competitors, with sport and more sport. At the menu: 10 stages including 2 loops, 6000 km to cover with over 3000 km of special stages, road sections having been reduced to their minimum. So as to make logistics plans easier for teams, a stock point will be organized this year in Russia. Vehicles driving on the convoy to Xi’an will have the possibility to drop off a part of their equipment (tyres, spare parts, etc.) at a stop point on the convoy’s route. This equipment will then be transported to Astrakhan aboard organization’s vehicles. Competitors will recover it up on their arrival in Russia, for the second part of the race. All the details regarding the organization of the stock point are available from the competitors’ Department. The French team PH Sport, well known for buying some of the former factory Peugeot 2008 and 3008 DKR, will be back in the Silk Way Rally 2018. From WRC to rallyraid, the team manages more than 100 meetings a year, on a wide range of programs. Bernard Piallat, its director, approaches the next Silk Way Rally with ambition, with the entry of the Peugeot 3008 DKR, driven by the British pilot Harry Hunt, who - bytheway - just crashed one of the Peugeot in the Abu Dhabi Desert Challenge. "As a motorsport amateur, I’ve always been attracted by rally-raids," said Bernard Pillard. "After more than 16 years of collaboration with PSA group in traditional rallies at all levels, Peugeot Sport has given us the opportunity and full confidence to manage the Peugeot 2008, then the 3008 DKR in rallyraid and on the Dakar. It is a proposal you cannot refuse, therefore we decided to jump into the big adventure." "China, the Gobi desert, the giant dunes and all the wide spaces of Russia make us dream"
The Silk Way is a main event for Piallat: "After the Dakar, this is for us the second most important meeting of the season. China, the Gobi desert, the giant dunes and all the wide spaces of Russia make us dream. We will race in incredible scenery and landscapes. In terms of experience and achievements the Silk Way Rally is of prime importance for the rest of our programme." An adventure rather different from WRC, isn’t it? "Indeed, you cannot really compare the disciplines. You have to be more careful than in traditional rallies, because the slightest fault can have disastrous consequences on stages of nearly 1,000 km. We evolve on very demanding terrains. Upstream preparation work is the key to success in this discipline. Rallyraid events are more like endurance races, especially on a rally like the Silk Way. We have a team of ten men, mechanics and engineers, perfectly trained for the discipline, some of whom have been integrated into the official Peugeot Sport team, notably on the Dakar and the Silk Way Rally, over the last two years." The Peugeot are built to win - and this is, what PH Sport announced their main goal. "Knowing that Harry Hunt finished fourth in the 2016 Silk Way Rally, we can only aim higher! So we are clearly aiming for victory. But we must be careful, as competition will be fierce. 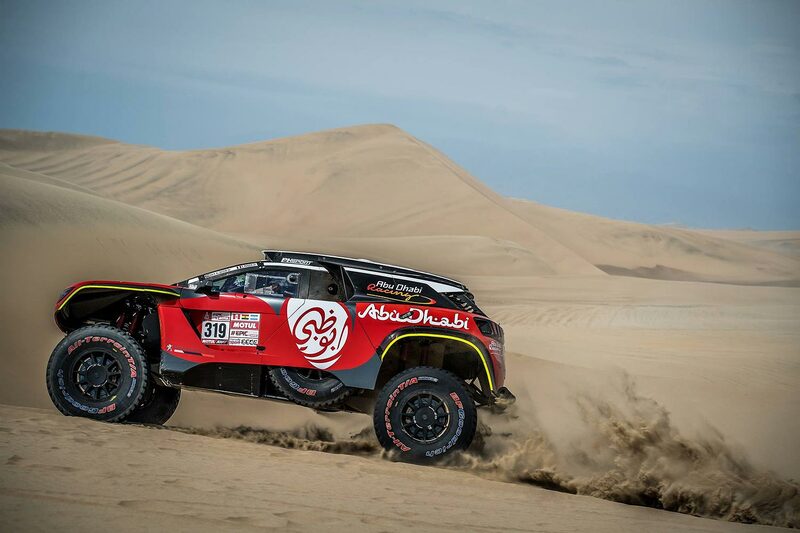 Our 6th place on the last Dakar with Khalid Al-Qassimi proved our value, but more recently in Abu Dhabi, we could notice that a private pilot like Martin Prokop from the Czech Republic could prove to be fearsome at the highest level. And it is without counting on teams such as X-Raid and Overdrive which we will meet in July... "